“Meet Captain America”: Who Wouldn’t Wanna Punch Hitler? I appreciate classic literature, music, and art. However, my favorite piece of art isn’t the Mona Lisa, The Starry Night, or even American Gothic. 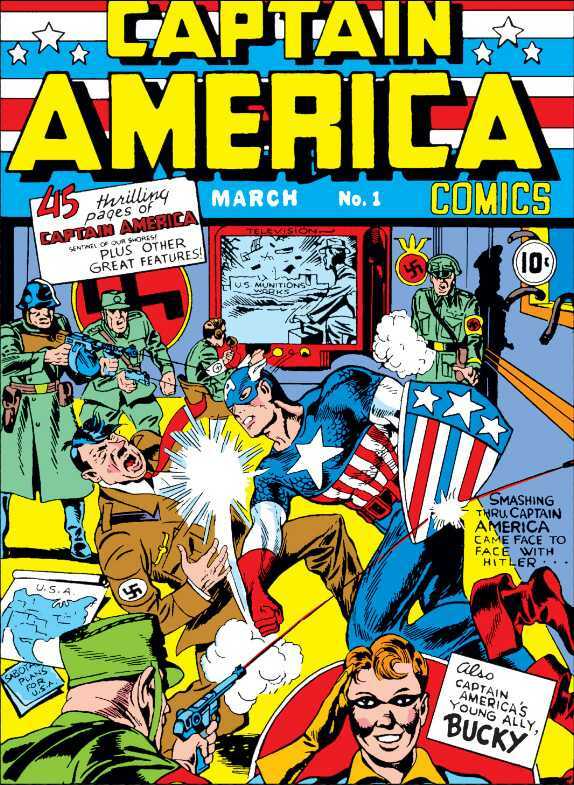 It’s on the cover of the first Captain America Comic Book. Captain America delivering a swift punch to Hitler’s face: a perfect piece of art. WWII; Hitler, the Nazi Army, and the Gestapo are reaping havoc… President Franklin Delano Roosevelt planned to send the Human Torch to America’s rescue; but a scientist, Professor Reinstein, had a better plan. He had developed a formula that when used would increase the recipients most dominate qualities. Reinstein had searched the Army high-and-low for the perfect subject, and had found one; Steve Rogers. The formula was a success, the once frail but patriotic and strong-willed Steve Rogers was transformed into a super soldier; Captain America. Professor Reinstein was overjoyed—but the celebration didn’t last long. A Gestapo spy, disguised as an American official, opened fire on the professor and his serum, destroying both. Capitan America quickly becomes an inspiration to all Americans and an object of fear to all enemies. At the end of the comic, James Bunchanan ‘Bucky’ Barnes walks into a cadet tent to find his friend, Steve Rodgers, changing into his Captain America costume. Having made the discovery, Bucky vows to keep Steve’s secret and become his side-kick. Yes it is. One of my favorites. Thank you.